A harbor police officer testified Tuesday about what happened after authorities recovered a floating barrel containing a body in the San Diego Bay in the preliminary hearing for two men charged in the stabbing death. 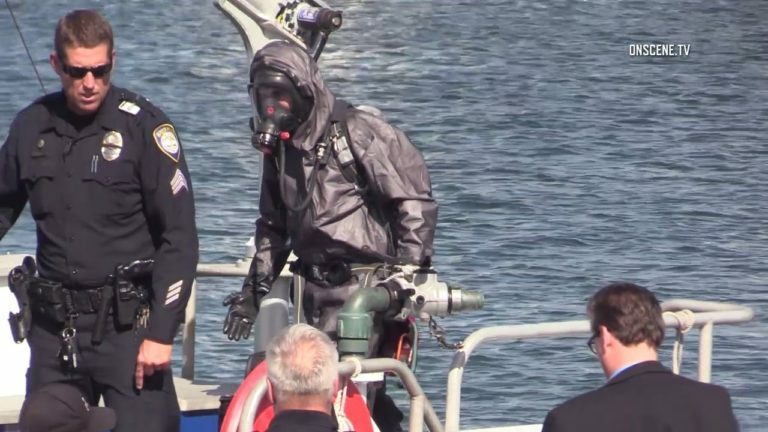 San Diego Harbor Police Officer Claudio Asiong told prosecutor Cherie Somerville that authorities had difficulty getting the barrel out of the water, but once it was out, one “could immediately smell a foul odor” emanating from it. Asiong’s testimony at the South Bay Courthouse was part of the preliminary hearing for two men facing charges in the stabbing death of another man whose body was found in that barrel. Timothy John Cook, 52, of Chula Vista is facing a first-degree murder charge in connection with the death of his roommate, 28-year-old Omar Medina. Derrick Jefferson Spurgeon, 38, of El Cajon, is facing a charge of being an accessory to murder after the fact, according to a previous news report. Both men were arrested Dec. 13, 2017. Prosecutors said Medina had been stabbed 66 times. Medina’s body was found by a diver on Oct. 12, 2017, stuffed inside a 55-gallon drum that was anchored to cinder blocks. Medina, a music producer from Chula Vista, had been reported missing by friends and family who had not seen him since Sept. 30. Manuel Salazar, a detective with the Chula Vista Police Department, identified photographs of human remains found in the barrel. Salazar said holes had been drilled in the barrel. Salazar testified that on Oct. 13 he observed an autopsy performed on the body, which showed wounds to the torso and one head wound. The county Medical Examiner’s Office determined Medina died from multiple sharp force injuries, Salazar said. Chula Vista Police Department Sgt. James Petray testified Tuesday that according to the investigation, Medina was last seen alive just before Oct. 1. Petray said detectives contacted Cook on Oct. 13, asking him if he’d seen Medina. Medina’s sister, Alicia Villegas, told authorities that Cook told her he’d last seen Medina on Sept. 1, Petray told the court. Petray also said that Cook told Villegas that Medina was intoxicated and invited him to a casino, but Cook declined his offer. Villegas told authorities that she last saw her brother in late September at their mother’s home, Petray said. The hearing will continue on Wednesday. Judge Stephanie Sontag will then decide if there is enough evidence against both defendants to hold them for trial.